Panoply 14880 Chic Boutique: Largest Selection of Prom, Evening, Homecoming, Quinceanera, Cocktail dresses & accessories. Elegant, but not demure, this crew neck and tank bodice is completely covered in ombre beaded rhinestones and beads. 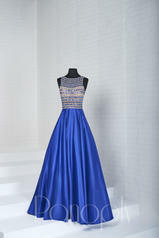 Features an open back and a full shimmer satin a-line skirt with pockets.